For some reason I've been wearing purple eyeshadow a lot recently, and I want to share this eyeshadow quad with you. 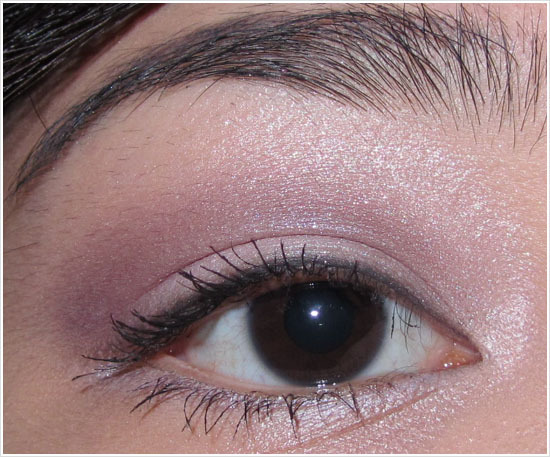 This is Neutrogena's Nourishing Eyeshadow Quad in Moonlit Violet. New nutrient-infused Neutrogena® Nourishing Eye Quad shadow gives eyes a beautifully smooth, vibrant look. The Base shade protects with SPF 15 as antioxidant vitamins condition like never before. The Highlighter shade visually lifts the area under the eyebrows with a blend of micronized pearls, while the Crease and Accent shades give eyes depth and dimensions. These eyeshadows are soft and have good payoff. I like how they are labelled Base, Crease, Highlighter and Accent, which can be useful to those just starting to get into makeup. The sponge tip applicator may also be useful, but I wouldn't be using it though as I feel my makeup brushes work better and are easier to clean! I personally do not know how an eyeshadow can be 'nourishing', but I don't mind this palette. I think these eyeshadows do crease a bit and fade a little, but not that much different from standard eyeshadows. This eyeshadow palette contains a satin pale pink, a frosty pale taupe, a semi-sparkly midtone violet and a semi-sparkly dark grey. I used the pale pink on the lid, midtone purple on the crease, light taupe as highlight, and black as a liner on the upper lash line.